Might peak oil and climate change outlive their usefulness as framings for Transition? “Another conclusion occurred. Further mention of climate change, peak oil and sustainability is probably pointless. Again, you are either preaching to the choir or the resistant. By now everybody has heard of those terms and must be intimately familiar with them. I don’t think there is anybody left who can genuinely call themselves undecided”. I thought this was a fascinating observation. Although it is peak oil and climate change that initially inspire Transition initiatives and form the underpinning for much of the initial awareness stage, might it be that an initiative reaches a point where continued focus on those issues could be counterproductive? His point is that most people have by now made up their mind as to whether they agree that peak oil and/or climate change are important issues or not. Beyond a certain point it could be that continued highlighting of the issues actually risks dividing and alienating people rather than including them? At the moment, the outward focus of TTT’s work is more explicitly about economic regeneration and social enterprise, rather than on promoting the issues of peak oil and climate change. We are promoting the concept of ‘localisation as economic development’ and about to start work on an ‘Economic Blueprint’ for the town, working with the Town Council, Chamber of Commerce and other local bodies. We are seeking to support emerging social enterprises and to create new mechanisms for inward investment. While all of this, clearly, is underpinned by an understanding of peak oil and climate change, we haven’t actually held a talk about peak or climate change for a while. Daring to Dream: what would it look like if every community had a vibrant Transition initiative and they were all actively transforming their local economies? Here we step into the speculative and wonder about where all this could go. In the first stage, peak oil and climate change serve as the absolutely vital framing, the inspiration and the motivator. In stage two, an ongoing programme keeping them out there as issues is also vital. By stage three, you are beginning to get into the field of the people who are open to knowing about it will probably already have picked up on it, and the rest of the people might be starting to feel a bit like you are ‘that lot’, like Transition is not for them, and starting to feel excluded from what is supposed to be a community-driven process. By stage four, ‘Building’, while any strategic thinking, such as an Energy Descent Action Plan, a local economic blueprint or whatever, clearly needs to be underpinned by peak oil and climate change, as well as the end of economic growth, the focus starts to shift to economic regeneration and enterprise. 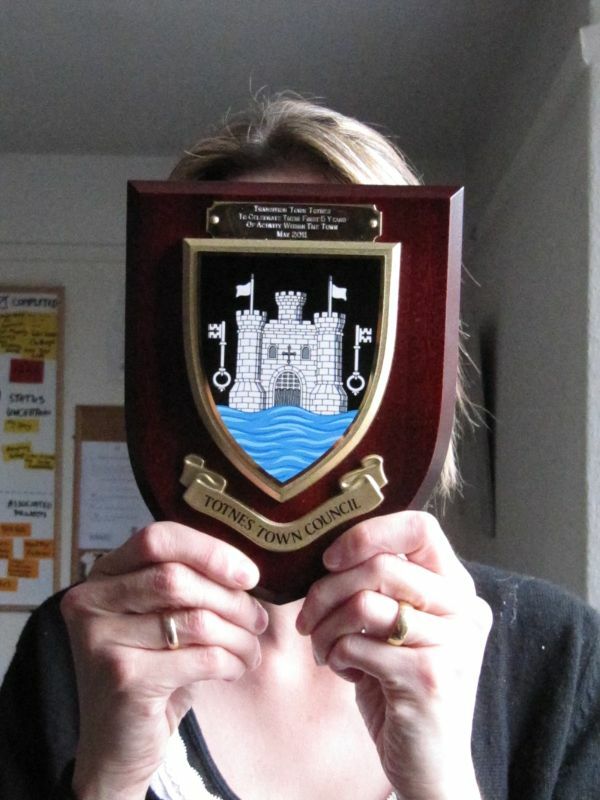 As the plaque from Totnes Town Council shows, at this point it is possible to be well and widely respected, but this is the stage where people are expecting great things and are expecting you to live up to the expectations you have created. Shifting the focus to ‘localisation as economic development’ offers the opportunity for those who felt excluded by the peak oil and climate change focus to step in, and for your Transition initiative to be seen as addressing local challenges as perceived by most people (lack of employment, skills and training, lack of affordable housing and so on). By this stage, awareness of peak oil and climate change are diffused into the DNA of the organisation. As TTT nears its fifth birthday, this is certainly our experience. People with great expertise and skills in business and livelihoods are coming on board to help drive forward our work in a range of initiatives and projects who may well not have done so before. 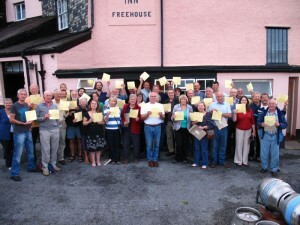 Topsham Ales share holders proudly displaying their share certificates... Credit: Mark Hodgson. In Topsham in Devon, Transition Town Topsham began in the usual way, showing films, holding events, doing some practical projects. They found though that engagement was only going so far. “Is peak oil the thing that will unite and inspire this community?” they asked. Probably not. “Climate change?” Again, probably not. “Beer?” Ah now you’re talking. Topsham Ales was funded by £35,000 raised in shares being sold to 56 members of the co-operative they created. It is rooted in the concept of localisation (uses local hops, spent hops go to local pigs, beers and labels celebrate local place and history) but not explicitly so. Might there be a lesson to be learnt from Topsham Ales in terms of the need, at a certain point in the evolution of a Transition initiative, to shift its focus? Discuss…. Really interesting think piece. Your pillar of the local community raises an interesting point, but where is the evidence that tells us that everyone is familiar with the terms `peak oil’ and `climate change’. The latter, possibly, but the former? I doubt it. Sure, amongst the broad brush sweep of the middle classes these terms have entered the vernacular, but right across the board? It might be worth having every Transition Group test it out on high streets up and down the country. Topsham’s example is interesting, but as ever, how do you reach beyond the self selecting group who come together to do this. As in many parts of the South West, there are uncomfortable extremes of affluence and poverty and the challenge is to reach out across social divides. All credit to Topsham doing their Slow Foodie Localism Transition thing, but the community is hardly representative. It’s one of the most expensive places to live in the country. Sadly I don’t have the answers, my last post on my own blog ponders how to engage more and the challenges to doing so and I’m struggling with it. (can be read at http://www.thecraftbaker.co.uk). Economic problems are biting people now. Peak oil & climate change in the future – if even believed. What is more likely to motivate? 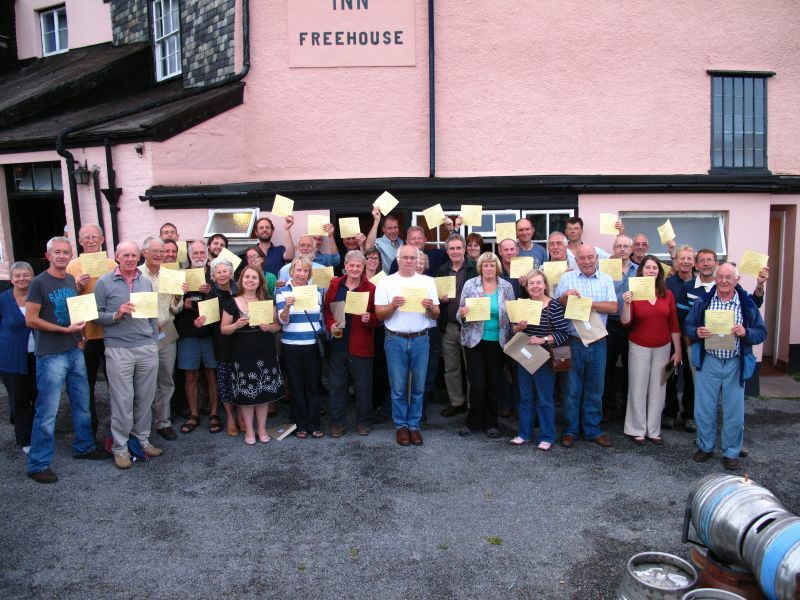 Just the other night we had an introductory TT evening in a town adjacent to our own, where no TT initiative exists (yet). We introduced the concept of Transition Towns, briefly explaining peak oil. It was immediately picked up by some ladies in the audience as a new consideration on the future. I guess this confirmes your thought that, in the early stages of a TT, peak oil may be more important than afterwards. Most people might have heard of ‘global warming’ and even if most now accept that it is taking place, this is not the same as accepting that it is caused by human activity, principally the burning of fossil fuels. If we accept human causes, then we can do something about it and propose human solutions. However, powerful vested interests have invested massively in undermining the scientific bases of ‘anthropogenic global warming’ which is why there is growing widespread doubt and confusion about the issue. Unless we continue to put the arguments and demonstrate the facts, then we are, basically, giving up the argument and undermining our own rationale, namely that we can do something about it, its going to be tough but it also has its rewards. Similarly with ‘peak oil’ (and the peak in other strategic resources). Fewer people may be aware of these issues but that is all the more reason why we still need to press the arguments. What’s more, it is simply wrong – as Darren suggests – that these are issues for the future and that they don’t impact on the here and now. The current high price of oil is, at least in part, underscored by the prospect, if not the current actuality, of diminishing supply. Again, it is necessary to demonstrate to people the connection between the supply of global resources and the sustainability of local communities. Without this connection, Transition loses its cutting edge; its economic necessity is replaced by a lifestyle and fashion. Just thought it was worth mentioning that the majority of people I speak to outside of environmental/green groups have not heard of Peak Oil and have no understanding of it. I think this is very important for us to remember. They are familiar with Climate Change and I would agree that the feeling is that it is a bit ‘boring’ and people have generally made their minds up or just don’t want to think about it. I think Peak Oil is maybe something that is easier for people to understand and they see it as being more relevant to their lives. I feel this has more scope as a way of connecting with the wider population and may lead to people becoming more innovative as time goes on. So basically by providing incentive and knowledge on growing your own food, planting fruit trees, learn how to make soap out of used frying oil, building and installing a ram pump, etc, etc, etc, we’re increasing local resilience and addressing peak oil & climate change without even having to mention it. And yes, it’s much easier to reach a broader spectrum of the community this way. Those being the pros, the cons would be a lack of a sense urgency and efficiency, but it doesn’t mean that you have to drop the issues of peak oils & climate change altogether. I agree with much of Angies comment and points she makes on her blog about peoples participation. Modern life / ‘the system’ is so all consuming that most people have little interest, if they have interest often they have little energy. I work on two projects in my community – which is very poor – many have no work and are homless. Both projects have people involved who are in these dire siuations. Both are very grass roots / non-heiretical. One is focusing on providing housing the other on collectivising economics – http://www.unitednotions.org.uk . Getting active particpation often feels like banging your head against a wall.Does anyone know the answer??? Back to transition – I think the climate change debate is tired and most are aware. Peak oil is probably not as well unnderstood in all sections of society – although everyone notices petrol prices. As I suggested in my last comment, life becoming harder will get instant attention. If unemployment rises people who have jobs organising/managing/decision making/participating (all be it in the corporate / public sector) are naturally likely to turn their skills to meeting their economic needs. If no jobs are a available a local community based collective/commons based response may appear attractive to them. Something to look forward to? Naive dreaming? I believe real economics (looking at what and why you community consumes and exactly how it is produced) and democracy (Im thinking direct democracy not (un)represetative democracy for community and work place) are crucial to getting a society where I could feel truely at peace(repeat previous paragraph). Good post Rob, thanks. At every Transition conference I have attended the discussion about whether or not to focus on Peak Oil and Climate Change has cropped up. Without it there is no sense of urgency to start relocalising. But as you suggest, the message of doom alienates many. We’ve been conducting another survey in Kinsale to gauge levels of awareness and we’re still coming across people who have not heard of peak oil. As any teacher will know, repetition is sometimes crucial in order to get the message across, because no matter how often you repeat something, there is always someone asleep at the back. PS Thanks for the fifth anniversary reminder. We’ll have to organise a party in Kinsale! Excellent post .yes climate change is old hat & the general public in the modern media age of constantly changing news are sadly bored by it. Peak Oil is not widely known outside people who have an inteerst in environmentalism/localism and is a tool still worth using at initial meetings. I think the Topsham example is spot on, practical projects demonstrating effective localisation and community involvement from which much can develop….and then the theory/ethics/policy angle can be learnt along the transition path alongside practical action. I now prefer to draw people in to Transition because the things we’re doing are “fun, useful (which can include saving money) and social”. Climate change, peak oil and the fragility of the financial system come later. By osmosis! 1. i might question if it is in danger of relegating the vision process to way down the line, ie no 5 ‘daring to dream’. Vision needs to sit right up there with the initial awareness raising process. obviously it needs to happen at point 5 too and what you are suggesting might be a way of reviewing a vision and adding more specifics and substance to it – but beware not to loose it from the initial hit. 2. you describe the process of development for the initiative, but important to also consider the process of the individuals’ involved, or yet to be involved, that run parallel and intertwined. I find the stages of change model continues to be useful in this by helping identify diff people’s needs at diff stages of the process. agree with others’ comments, ie your initial commentator’s points are probably true to climate change, but I am not sure about peak oil. even those of us very involved and exposed to peak oil are always learning more about just how much of our lives is affected by peak oil – including me particularly. we never stop awareness raising in this way – its probably more about the way we are communicating it and making it relevant to people. 3. I have been trying a different structure to talks and workshops recently which seems to work now both TN and TTT have more concrete achievements to talk about. I start by bigging up our achievements and impacts, 40 projects in 4 years, 470 households engaged in T streets, 30countries now following same idea etc etc. this builds up cred and gives all the people who don’t want to accept CC many reasons to respect, identify with and hopefully get involved with our work. i then drop in the peak oil story, so they understand the agenda that underpins all that they have just heard. This is important to distinguish us from other organisations in the community now social enterprise and community welbeing are so much more explicitly in our vocabulary – there are obviously others looking at economic & social development and services). still working on this but seems to be working better, esp on more conservative and traditional sectors of which we have many in South Devon. . This chimes with what has been going through my head recently, after a particularly challenging conversation with a local bossyboots. It was of the “don’t worry the Russian oil wells are filling back up” variety. Reframing the discussion around economic benefits and resilience to external shocks is one way of shifting the conversation away from a polarised argument on whether or not any one particular shock is likely to happen. Neither of us were going to change our minds about peak oil but we didn’t need to in order to agree on other stuff – no point appearing so entrenched that it looks like a religion. Interesting and thought-provoking article Rob. And interesting comments too. Like many, in my experience in talking to people about the Transition model, almost everyone, from all walks of society have heard of climate change, and know about it. But very few know about peak oil. For me, that’s the one thing that sets Transition apart from other “environmental” organisations. Last summer we made a film for Transition Barcelona, at a local eco fair. When recording people, everyone said they knew what climate change was, but almost no one could tell us what peak oil was… and this was at an eco fair, with a so-called environmentally aware public! So, i don’t agree that peak oil should be left off the Transition agenda. I think it should be at the heart of it. If explained well, anyone (no matter what their background or level of education) should be able to grasp and understand it. If someone doesn’t ‘get’ peak oil, and how it’s related to their consumption and economic levels, why would they be motivated to get involved with a Transition group, as opposed to any other group? As Hal points out, its about making peak oil relevant to people’s every day lives… but i guess this will happen anyway soon, regardless of weather people are involved with Transition or not! Economic relocalization has myriad virtues beyond responsiveness to peak oil and climate change, especially where relocalization has the effect of providing people with a sense of local community with an emerging culture of cooperation and kindness. For this reason, relocalization efforts would be worthwhile even if peak oil and climate change were not happening. and emphasizes lowered fossil fuel inputs, is the necessary lifeboat (ark?) which will be more and more urgent as time rolls on. But not everyone involved in Transition needs to be doing so because they believe what I just said about peak oil and climate change. I’d want to support Transition even if I did not believe these things. I’d be involved in Transition for the community-building aspect alone–, for the experience of knowing and working with my neighbors toward a more cooperative, collaborative local way of life. For the feeling and knowledge of a community of scale. For belonging. But I would not worry too much that talk of peak oil or climate change might alienate some. Instead, I’d weave the community building strand into the rope of Transition, such that community building, on its own virtues and grounds, is as core to Transition as those other strands. Each of the strands are strong enough motivators, and sufficient justificational grounds, for Transition. “What if 2061 doesn’t look a lot different from 2011? Won’t there be egg on yer face, then?” Well, no. There’s no requirement that the world begin looking like the second episode of “Survivors” to justify my way of life. Retiring debt, not driving a lot, growing nearly all my own food, and securing energy supplies on-site gives me a healthy economic buffer and healthful activities to do, as well as a healthier conscience. These are not trivialities. Alexis nailed it. The concepts of peak oil and climate change, while not insignificant, tend by their nature to be more abstract and distant from our lives. Their effects are real and tangible but generally translate into an economic impact. Localisation as economic development: OVESCO (set up by Transition Town Lewes) is working with Harveys the local brewer, Southern Solar a local installer, local engineers, a local roofing company and using £306,000 raised through a community share issue (95% local investment), to invest in 544 PV panels to generate local power at Harevey warehouse. If only we could buy the PV panels with the Lewes Pound and close the loop! I can appreciate that if you are setting up a Transition Initiative you don’t want to keep banging on about peak oil and climate change all the time. If you want to keep peoples interest you have to look at issues that affect your local area and set up projects that are relevant to that community. However if you think that nearly everyone knows about peak oil then you are mistaken. I try to do some campaigning on peak oil through my local MP and believe me peak oil is something that most people are ignorant about. Those people who have heard about peak oil are pretty vague about it and have no idea of the amount of evidence there is about it. You can hardly blame them as peak oil is an issue that rarely gets a mention in the media. There is the odd report in the quality press or on the news, but it is easy to dismiss it as just another scare story. It is not just the media that ignores peak oil. Most of the political establishment know little about the issue and it barely gets a mention in the political discourse of this country. This is surprising given the fact that the Department of Energy and Climate Change (DECC) is beginning to recognise the problem. In a letter to my MP the DECC state that there is much uncertainty about peak oil and that their chief scientist has put out a call for evidence on the issue. I think there was a story in the about this in the Guardian last year. So this should be at the top of the political agenda, but it’s not because most politicians know so little about peak oil. Surely this highlights the biggest failure of the transition movement. The first step in dealing with any problem is to recognise that you have got a problem. However most people do not recognise that we have a problem with peak oil, so they do not see any need to do anything about it. Probably the most important place to start is with the media and political establishment. If you cannot convince them that there is a problem with peak oil then you are going to get nowhere. You may get a few local initiatives under way, but if the media and political establishment is not moving in the same direction then these will have little affect. I appreciate that some politicians may know more about peak oil than they are letting on, but are not doing anything due to short term political interest or are just in denial. But until the transition movement put peak oil on the national agenda this is not going to change. Unlike climate change, peak oil should be something that is easy to understand. Most people understood that were limitations on oil supply during the oil crisis of the 1970’s and as a result western nations did manage to reduce their oil consumption. If this has been done before it should be possible to do it again. Not so, exactly. Global warming is a major factor in the planetary biodiversity crisis, which is about extinction of species and may ultimately result in the extincytion of our own — if the worst case scenarios come to pass. And peak oil could precipitate a complete collapse of the present global economic system, which has been entirely dependent on continuing growth in order that it not fall into collapse. So this is more than a mere “economic impact” we’re talking about. So much more is at risk than a mere economic recession. If we’re not prepared, famine seems a very real possibility — the world’s first global one. Yes, this is about economics, but it is also about a major world crisis in potential. Only by preparing a bridge to a livable future ahead of the collapse may we avert the worst. I don’t think we can afford to walk on egg shells for fear that the severity of this crisis will spook people out of interest and support. We’re not shouting doom, we’re showing the way to a livable future–and likely a happier one. Quite early in the process I realised that even if peak oil and climate change didn’t exist I’d still want to do transition. I’ve shifted from thinking about transfer of information and fearfulness, towards community building for genuine resilience. When we have done awareness raising films it’s often people who are already interested in that kind of thing that come along. It feels a bit worthy. But when we trigger off people’s innate desire to connect, things can get interesting and inspiring. I think the whole stepping outside the comfort zone to engage everyone and getting tangible projects off the ground quickly are key elements for successful transitioning. I agree with Hal’s bigging up the successes idea, basic salesmanship, and Alexis’s pitch too. We have to be the new new that makes people want to copy and join in. Good point, Miguel. Community resilience is resilience, regardless of the challenges before us. I live on a farm in a rural community where “globalwarmingscam.com” is popular. I can be far more effective talking about relocalization of energy (Minnesota is a windy state), of resources, of jobs and economy. We’ve talked about relocalization as an objective for disaster preparedness. My local community is not an official TT, but they held a community visioning session last year with turnout of 15% of the population. Mapped the outcomes (assets, challenges, vision), prioritized based on the law of 2 feet, and set up 4 task forces (working groups) on the leading issues. Things like a walkable/bikeable community, local food coop, expanded community garden, local entertainment, more opportunities to build local relationships, to inspire/support/retain local entrepreneurs, to “go greener” were all priorities identified by the community. Doing “t”ransition without the capital “T”. Economy and energy are both hot topics, and not nearly as polarizing as climate change. Most of these folks haven’t heard the term “peak oil”, but if you talk about energy scarcity and the relationship to the economy, they know all about it. This is a farming community. They totally get the relationship between energy prices and food, the struggle to balance biofuels acres with food production acres, and the relationship of grain availability to feeding livestock operations vs cereal grains for human consumption. It doesn’t matter to me if farmers are switching to biological agriculture because they are fed up with working with Monsanto or if they are doing it because they are concerned about peak oil. As long as the outcomes are supporting resilience in a post carbon world, I’ll engage in the conversation with whatever language is culturally appropriate and aligned with the overall objectives of Transition! Without a doubt, the most profound and important question you have ever asked about Transition Towns. We need a whole dialogue on this subject alone. Thanks for having the courage to bring it up. Or possibly just one of a number of questions we need to ask ourselves. Is the movement still growing and if not why not? Is Transition moving fast enough given the extent of the crisis? Aren’t all Transition Initiatives struggling with group dynamics and activist burnout and so why aren’t we talking more about this? Can we seriously part of any national dialogue if we don’t have more people working full time on lobbying and engaging with the powers that be? Do we want to part of a national dialogue or are we better off simply trying to walk away from the systems that have put us in the mess we’re in? How realistic is walking away anyway? How do we create non-grant funded livelihoods in Transition? Does Transition lead to deep behavioural change? No shortage of questions to ask methinks. Lucky therefore that the annual Transition Conference is coming up soon! Living, as I do, on “the other side of the pond” (USA), I’ll remind readers here that the USA is hardly half a step further or behind in recognizing peak oil as a crucial or important matter — in government or outside of it. My own view is that there is an (oily?) international “establishment” order in politics and media, and peak oil is among those things that have not yet been stamped for approval as “mainstream” by that establishment. This means that it’s not so much even open for serious public discussion. Readers here will recall that the same was recently true about global warming / climate change. It seems that Transition Initiatives have realized the importance of meeting people where they’re at – finding points of resonance, and places to get traction. It’s extremely difficult to get people to change their worldview, and more often than not takes years. We don’t have that kind of time, so what can we do? We can look at the behaviors or outcomes we’d like to see, appeal to people in ways that resonate with their worldview, and in terms of the issues they care about. What is important in the end is not that we get everyone to believe as we do, but that behavior changes…regardless of the reasons people have for changing behavior. In that sense, working to get a wide public consensus about peak oil and climate change is not necessarily the most important task of the moment. I do see a danger, however, of Transition Initiatives downplaying or disregarding these issues. What happens when new leadership comes in? Have they been steeped in ideas about Transition as preparation for life after oil? How confident can we be that this kind of thinking will remain in the DNA of the organization? Unless we continue to make Energy Descent Planning a central feature and focus of Transition Initiatives, we risk a gradual watering down of the raison d’etre of our movement. As has been seen with other sustainability movements, it can be quite easy to go astray. My town of Bellingham, WA, USA is the home of BALLE (Business Alliance for Local Living Economies), and its flagship organization Sustainable Connections. They do GREAT work toward growing local and sustainability minded businesses. However, they are still caught in the trap of the economic growth model. These businesses are “on the path to sustainability” but not really sustainable. We would be well advised to keep Holmgren’s book, in addition to what I consider it’s companion, The Transition Handbook, close by as we continue to design our Energy Descent Pathways. My frame has always been about creating the world we want and peak oil and climate change have just been the trigger. Do we still need a trigger? Oh, I so totally agree with this. I’ve been thinking for a while now that you don’t engage the majority via concepts/ideas (‘peak oil’); you engage through praxis/system (‘beer’). Of course, you do need the ‘peak oil’ to make the ‘beer’, but you also need the ‘beer’ to communicate the ‘peak oil’; the ‘beer’ functions as the lived reality, the embodiment of the ‘peak oil’, and it seems to me that tangibles like ‘beer’ seem to work best of all as communication modes. Also, ‘peak oil’ without ‘beer’ is just so totally pointless; and ‘beer’ without ‘peak oil’ runs the risk of being an ineffectual one-off, or else being easily written off as the random craziness of a dreamer. So I guess the medium really is the message. Indeed. Our own approach began with making the case for sustainable local economies as a bottom up approach to economic development and in 1999 there was a chance to demonstrate in Russia. This as we can see now was a prelude to what could be described as peak credit. People-Centered Economic Development has operated from the UK since 2004. The point about the local beer brewery is that Topsham is building a social network, not just a business. It’s about connecting and strengthening relationships, and expanding the social network to new people in the community. It’s a local on-the-ground, face-to-face network, not a web site. And it’s about providing a food source (yes, some people think beer is food, although I’m not one), and food is a vital resource that people want to have control over and make themselves. I’m doing something similar in Fredericton, NB. I started a social group for the gay community, because gay people are a vulnerable minority who would likely be left out in a crisis. We had become too dependent on the internet and the bar scene and became estranged from each other. So we came together around creating a local queer culture. It’s not Transition Towns but it serves some of the same functions–it builds a close social network. And yes, I purposely created the group having peak oil and climate change in mind, although that obviously wasn’t the main incentive. It’s about creating a local culture for ourselves that brings people together. You might argue, “well ANY social group serves that purpose–even a bowling league.” And you would be absolutely right. We need more local culture–food, music, art–and rich social networks. Social research shows that any town that has a local singing group or choir has the strongest social networks. Want to help Transition to a new sustainable word? Start a local choral group. One’s just started in Transition Town Edinburgh! We’ve been struggling with exactly this question and came to very much the same conclusion, changing our name from Transition Oakville to Go Local Oakville and going for incorporation and securing grants for relocalization work. Social enterprise is identified as our next initiative. I think that we need all approaches/lenses to move forward. Peak Oil, Climate Change, Relocalization, economics,creating community/culture etc. One size does not fit all. And we need to remember to make it FUN (not something that’s easy for me to remember either). Just a plug for coops (like the brewery mentioned earlier). One our important works is to help put into place the structures that will be needed when the crash comes. Coops are an important part of that. I often prefer to be less specific, explaining Transition as a response to a world of “increasing instability / unpredictability and diminishing resources” (or words to that effect) – which covers climate change and peak oil, but is usually quickly agreed with by those who are sceptical or ignorant of those issues, who perhaps think of the economic / financial context first. The Transition response is to increase resilience – equipping communities to be ready for uncertain times by strengthening relationships and diversifying the skill base – and this is relevant whether it’s climate, social, resource or financial uncertainty you have in mind. This perhaps accounts for the resonance between Transition and the “Big Society” concept, or the “Co-operative Council” proposed here in Lambeth. While often perceived as “covers for cuts”, I would suggest they are part of an instinctive society-wide response to crisis and feared scarcity – an instinct to co-operate, bringing the collective intelligence and resources of the community to bear on problems that are too big and complex for any leader or hierarchical system to respond to effectively. The prevalence of social media also plays a key role (both causal and responsive) in this shift. I still feel it’s important that the solutions proposed by Transition have a genuine relevance to climate change and peak oil. It may be the “fun stuff” that attracts wide participation, but I would say the most active and dedicated Transitioners are doing it because they have real and passionate concerns about these issues. The best Transition projects are win-wins: we prepare for the future while also enjoying life now (making friends, learning skills, creating new jobs, etc). But part of what drives Transition is the deep sense that the wellbeing and ultimately the survival of our families and communities are at stake if we do not develop the self-reliance and support networks to handle the shocks that may be coming. The movement’s energy and momentum, and the attention it attracts, comes from the fact that we are actively responding to changes many are in denial about. Nevertheless, many people have more immediate problems to deal with than climate change and peak oil. It might be unemployment, depression / mental illness, or gang violence, to name a few of the commonest ones round here. Or looking further afield it might be war, political oppression or extreme poverty. (Yes, it might also be climate change-driven extreme weather, and oil-driven food price rises, but not all problems can be tied to climate or oil.) Transition does risk alienating people if it appears to exaggerate the importance of future risks, while bypassing the reality of present suffering. Can Transition actively seek synergies between resolving today’s and tomorrow’s thorniest problems? Human beings are emotional, not rational. We can take decisions for rational reasons, but if the decision does not match with our underlying emotions then it will not stand the test of time. The emotional reason people get involved with Transition is to feel connected, to (re-)build community. Climate Change and Peak Oil are just rationalisations that give us permission to do what we wanted to do anyway, emotionally. What Transition is really about is creating the connected lifestyle (please forgive the word) that people want anyway, irrespective of PO and CC. So what does this mean Transition should do next? – one is dissatisfaction with the current situation, or what will happen if we continue as we are. A town or village is an organisation, a collection of human beings, albeit a relatively unstructured one. Therefore Transition, to be successful, needs to create these things. Where should we focus our efforts? Which of the three parts is not strong enough? PO and CC, surely, are part of creating dissatisfaction with what our lives will be like if we continue as we are. As your ‘Local Pillar’ pointed out, additional effort ‘banging on’ in this area isn’t creating much change. In that case, we can either decide that we need to come up with another reason in this area why the current system isn’t working. Another ‘scare story’. (“buy this share certificate and I’ll take care of the rest”). @Hanna, What you’re say has significant resonance with our own efforts, which began not far from you in Streatham 7 years ago. Clearly there was an issue of environment sustainability to be concerned about, yet what had brought us to this position had been propagated by a unsustainable economic paradigm – capitalism. On reflection, to be talking then about the insufficiency of our economic model would have been incomprehensible to many. This however is the roots for self-sustaining social enterprise and local economic development. With the current developments in Spain and those closer to home, gave cause to reflect on why it had been so difficult to get across an idea. Middle England was indignant about the planet, but perhaps not so much about the development of local community economies. Perhaps now it will be better understood? In New Zealand we have just had warning that, because of the two Christchurch earthquakes, the Queensland floods and the Japanese tsunami, our house insurance premiums may rise by as much as 50%. We have just had an austere budget and things will get worse economically. So I entirely agree that the focus should be on local economic development. We still need our energy descent plan (our local towns is being done by our council because of our TT group and a progressive community board and council). We will still need our food groups and our focus on future transport. We plan to work with our Clean Tech Centre which has started to house a growing band of green businesses and now we need to expand our timebank’s activity, start a local voucher scheme, get the coops guy to come and talk, invent some new alternative for insurance. We in New Zealand have already invented our own cheap ecohouse using a collective on the model of the JAK bank in Sweden. It cost $30,000 and is built of local materials (Pumice). Living Economies http://www.le.org.nz recently had four permaculture teachers attending its AGM. I agree that we need to broaden the Transition message out from just PO and CC. My impression in the UK is that what people are worrying about personally right now is the recession and the cuts, and also that a lot of activist energy is focussed on the more immediate problems of resisting cuts, stopping forest sell-offs, saving the NHS etc. So climate change can seem a bit less immediate, and even these days a bit “past it”. The media did it a great disservice during the Copenhagen talks, over-hyping it and then losing interest, so it seems a bit “been there, done that, failed” to a lot of people. I’d like to see Transition promote itself more, in this country anyway, as engaging as much with the economic climate as the environmental one, and talk more about building personal and social resilience in the face of economic difficulties. And join the debate on to what extent we need to rely on expensive, tax-payer funded government services and whether there are areas people could do more for themselves. Something that’s hugely struck me over the last few months is the number of people I’ve talked to in Totnes who up til now maybe haven’t been very interested in Transition, but have appreciated being part of the Transition Streets programme. and what they talk about is not the free PV panels, not how they’ve reduced their CO2 emissions, not what they’ve learned from the workbook, but how it’s built community, how they know their neighbours better, the differing schemes they’ve come up with to carry on building community on an ultra-local scale. That seems to me to be what people are crying out for right now. I ran an Inner Transition event yesterday, and the feedback I got from several people was that they feel they’ve moved over the last year from feeling they could fight climate change to focussing much more on how to best live with it. I think that reflects a common feeling right now. But one last thought on PO and CC, which I do think people do need to keep being reminded of. Climate Change is scary but vague, distant, happening to other people. Peak Oil comes across more to many people as something that will affect them personally, hit their own pockets more clearly and more imminently. So if that’s a motivation too, let’s keep using it. PO and CC are most certainly cause for concern, though not so much a cause as a symptom of an underlying problem – an economic model which is itself unsustainable. In presentations for the Economics for Ecology conferences we paint the background which had led to the crisis of 2008. Since 1996, it had been argued that an economic paradigm based on money imagined into existence by debt, had disenfranchised more than a billion to the point of threatening their lives. It was something affecting only those in other countries. The call was for an alternative which placed people ahead of profit and numbers. What we perceive is a transition in economics from a 20th century approach of production and scarcity where people are passive consumers to a new people-centered economies in which social enterprise and localism are key components. Hmm.Take a look at this Cultural Dynamics article..
and other articles on the same website. PO and CC work for some but not for all. As Transition Groups develop, they discover that fundamentally, many are just not motivated by these issues. They connect more with local traditions, skills, eco-bling, etc. This de-rates the messages of climate change and peak oil which to many are abstract, overwhelming and hard to connect normal daily life to. I’d put the point that to gain wider connections within each community as a Transition group grows, it needs to adapt it’s message, it’s ‘sales pitch’ to have a wider appeal by focusing on local jobs, saving money, retaining traditional skills, drinking local beer etc.. Transition within communities needs to hold onto the values that motivate those that are passionate about these things, but also to learn to find other motivators which connect with the beliefs of others. Don’t loose site of the fact that all communities are a healthy mix of Pioneers, Prospectors and Settlers. Finding ways to appeal to all 3 sections will strengthen your efforts, and also show that it’s not just giant global issues that are driving healthy local change. I dont refer to Peak Oil, I refer to ‘the decline in world oil supply’. Many of those who do the research think that shortages will be clearly apparent in 2011, 2013. Its important to tell people that when petrol prices go thru the roof, it is the real world and not an aberation. The answer – transtition. When the BNP has peak oil as one of its big concerns (as it does), how does Transition differentiate its stance on peak oil from the BNP’s? What is it about the concept of peak oil that appeals to a fascist organisation? Is there any (worrying) commonality between the BNP’s take on it and Transition’s? I’ve never understood why Transition has felt it necessary to focus on peak oil – there are so many other ways of approaching the need to reduce our energy use and greenhouse gas emissions. And maybe now that the BNP has climbed into the peak oil bed, it’s time to either challenge them on their reasons or to get out of that particular bed.Or maybe both? As I see it, we will be into the big decline in world oil supply this year or next. And events in the middle east seems to be singing the same tune as the world’s geoleogy. So, very bad news for continuing the way we live today. What will it be like? As cheap oil supply declines we can expect an increase in the economic decline we see today. This will result in huge unemployment queues and closed shops everywhere. Mortgages will not be able to be paid and at some stage superannuation will also fail to keep up anywhere near inflation. There will be shortages as globalisation unwinds and critical parts made in faroff countries will no longer be available. Our infrastructure depends upon these things. Transition offers a way forward which accepts the future. The Peak Oil message will be ignored for as long as possible (who wants to break up a nice smily 60 year party with bad news)but it will be gentler for everyone if they know why the wheels are falling off our physical and social infrastructure. Its not ‘those evil people’; its just the realities of not living sustainably. The sooner we (and I mean everyone living unstainably, thats all of us) know about it the sooner we can react. The human race can go forward sustainably and caringly and rationally or it can go forward into a world of fear, war and famine. We push for caring and rationality. Peak Oil is a change in the era of human history, the likes of which we have not seen for thousands of years. It’s hard to talk about Peak Oil when here in Canada the news is that the Tar Sands in Alberta and those to be exploited in Saskatchewan (and many other parts of the world), will provide oil for the next 100 years! Of course, it will be very expensive so we at Transition Denman Island (a paradisical BC Gulf Island, population 1,100) prefer to talk about the coming energy and food crises. We have started a Denman Feeding Denman Action Group and 11 other groups involved in agriculture! We have a web-based rideshare system and are looking at communal vehicles as the ferry fares will prohibit us driving alone to Courtenay to shop! Thanks for your great work!